This is soup day! That’s right!!! I am serving one of my family’s favorite soups for dinner tonight: Ravioli Soup! 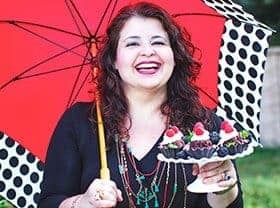 Well, she and her husband took us to this cozy restaurant in Rio Grande do Sul State, on the road between the towns of Garibaldi and Bento Gonçalves in the heart of Brazil’s wine country. At the time the restaurant was named Giuseppe’s, but now is called Casa di Paolo. Since then, I have been making this ravioli soup — or at least my take on Giuseppe’s soup, substituting ravioli for cappelletti. This clear broth soup is quick and easy to make…. But don’t be fooled by its simplicity!!! Although our ravioli soup requires few ingredients, it tastes AMAZING. 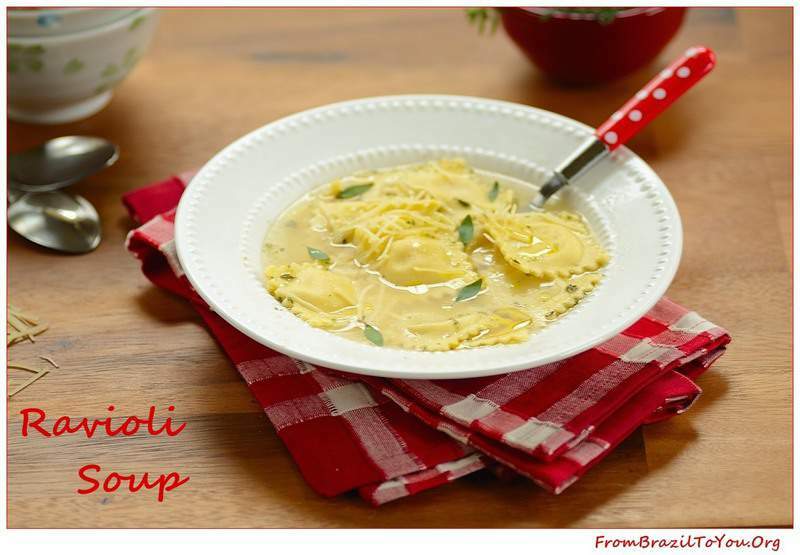 Try this ravioli soup and you’ll see just what I am talking about…. 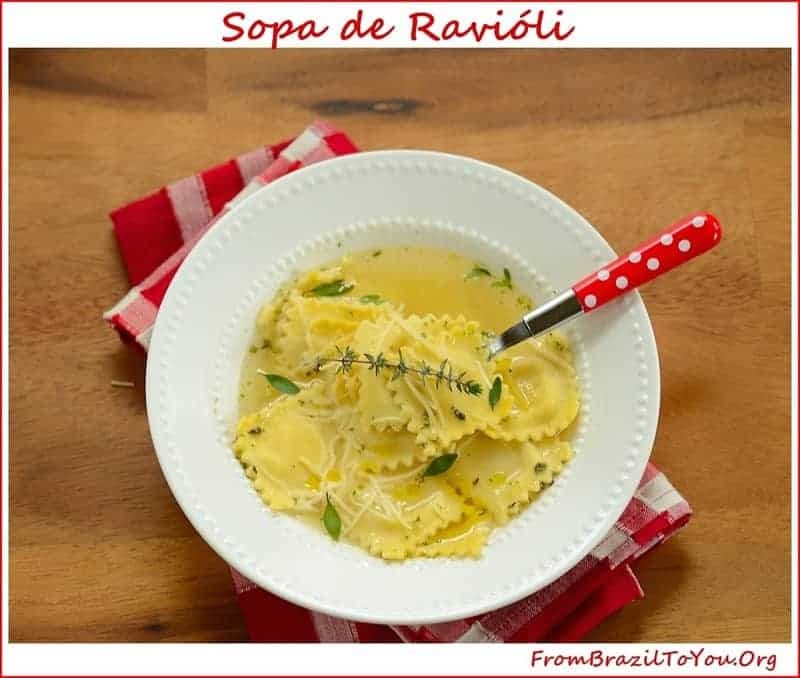 Ravioli Soup (Sopa de Ravióli): Love at first bite! 1. In a large saucepan, heat the oil over medium-high heat and sauté the shallots until translucent, stirring occasionally. Pour the wine and let evaporate to half. Add the broth, salt, and pepper; then stir and bring to a boil. 2. Add the ravioli and reduce heat to medium-low. Let ravioli cook uncovered for about 7-9 minutes or until tender. Add the thyme, adjust the seasonings, and serve ravioli soup hot with a drizzle of olive oil and cheese on top, if desired. This idea is wonderful. We have the wonton soup but never ravioli, but please, it’s quite the same (sorry for Italians and Chinese), I mean, both are paste filled with something. I can’t wait for Winter to try this. What a marvelous soup recipe, easy and bursting with flavor! A fantastic weeknight dinner idea! Wow Denise, just a handful of ingredients and the soup looks amazing! We have a lot of snow in our forecast the next few days, I am going to make this. Made soup today too..it was cold over here. I wish I was there to eat your soup. You make great food. I hope you have the opportunity to try this ravioli soup. It is one of my family’s favorite soup. I’ve never made homemade ravioli but we always stock ravioli in case of busy night. I love your ravioli soup…so comforting especially on cold nights we’re having. My family and I love soups…This one is one of our favorite. It’s simple, quick to make but full of flavor. This sounds so simple and beautiful. My husband will love it. Thanks! Glad that you like this soup, Ginny! It’s one of my family’s favorite soups. Since I wasn’t able to find cappelleti at my local supermarkets, I used tortellini instead (the closest in shape to cappelletti). I even put a note under the recipe in English.